Nancy Andria, Colleen Werle, and Karen Hoyer give birth to the next tyrannical politician. Knowing only that Theatre Zarko’s He Who would feature a giant puppet baby, I arrived at Steppenwolf’s Merle Reskin Garage Theatre with both a deep curiosity and limited expectations. How could this play possibly be anything other than some sort of surreal comedy? Fortunately, He Who is about much more than a giant puppet baby; this is clear in both its production and meaning. Theatre Zarko, headed by Michael Montenegro (writer and director of He Who), is more an organic collaboration between writer, actors, and audience than a traditional play. In a post-show talk-back, Montenegro informed the audience that the show’s content had changed based on the response of audience members, and might continue to develop in the coming weeks. 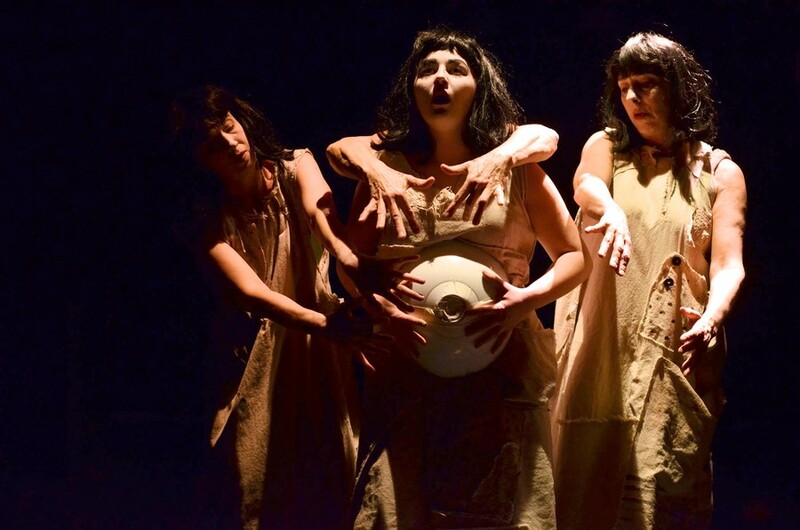 Ostensibly, the play depicts the struggle of three women as they attempt to take care of a loud, demanding baby. Like other experimental theater pieces, He Who is thin on plot. Plot, however, is hardly the point: Rather than tell a compelling story, Montenegro and the cast of He Who aim to make the audience think (and ponder, and leave the theater more confused than when they entered). The puppet baby is made of taupe canvas draped over metal wire and has a single light bulb for an eye and crossed wire as a mouth. For readers unfamiliar with the work of Theatre Zarko, the puppets are reminiscent of Tim Burton’s work. Puppeteers Noah Silver-Mathews and Katie Jones add an extraordinary amount of life to their materials, and arouse the audience’s sympathy and fear for the strange creature through the slightest movements of their wrists. Dressed in matching canvas dresses and black wigs, three nameless women played by Nancy Andria, Karen Hoyer, and Laura Montenegro speak intermittently as a chorus. When speaking alone, the actresses never speak as individual characters with unique personalities but rather as one face of the three. The women begrudgingly begin to care for the baby by feeding it and helping it go to the bathroom. When the women aren’t caring for the baby, they play with two smaller male and female puppets, acting out what presumably is the story of lost love between them and the baby’s father. In a scene that reoccurs several times throughout the play, an unsettling woman dressed in a red suit and with a mask-like painted face (Ellen O’Keefe) asks the women a series of mundane questions and torments them with increasing pressure to answer her. The piece’s music oscillates between otherworldly noises and melodies that seem vaguely Eastern European, with instruments as varied as an accordion, base guitar, keyboard, trombone, djembe, slide flute, and more. Musicians Ben Goldberger and Stephen Lieto moved to the center of the stage at the emotional climax of the play, erasing the line that separates the musicians’ performing space on the side from the main stage. I saw the play as a commentary on gender and motherhood, though the actors and director suggested that this interpretation is not definitive. The interaction between the women and the baby immediately made me think of the Freudian notion of motherhood, more specifically of the theories of Donald Winnicott and Melanie Klein. The women feel detached from their child, who offer them nothing in return, for their own nourishment and sexual fulfillment, aligning directly with these theorists’ view of motherhood. Montenegro explains that the baby for him represents the childish, needy political leader who demands the care of others but does not care for them in return. In this sense, the play serves as a social commentary on tyrannical leaders. Theatre Zarko succeeds in creating a piece that is both thought-provoking and heart-breaking in terms of its theme and style. One rarely finds that combination of an emotive work and a social commentary, and rarer still does one find these qualities as told here through Latin chanting, masks, and puppets. I may have entered the theater thinking of a giant puppet baby, but I left wondering about the overwhelming social hierarchy in which we are all entangled.